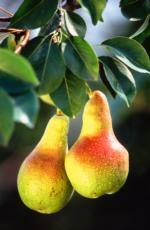 Of all the deciduous fruit tree species, pears are the most tolerant of wet soil conditions. Yet they perform best on deep, well-drained sites. Pears are the most pest-ridden of all fruit trees and require the most sprays to keep clean. Pear trees grow very large, requiring a 18×18 ft. spacing, without dwarfing rootstock or summer pruning. Trees also have a tendency to grow very upright and must be trained to develop a spreading growth habit. Most pear varieties are self-sterile and require cross-pollination by another variety to get a good crop set. One exception is the Sacramento River delta region where “Bartlett” is self-fruitful, setting crops of parthenocarpic fruits. Fire blight (bacterial disease) is a serious problem in pears. “Bartlett,” which makes up 75% of the world’s production and acreage, has a chilling requirement of about 1500 hours. Days from full bloom to harvest range from about 115 to 165 for European and Asian pears. Spray trees with dormant oil to control San Jose scale, aphid eggs, mite eggs and overwintering adult pear psylla. Remove diseased (fire blighted) and broken limbs. Thin pears to 6" apart if crop is heavy. Fertilize prior to first irrigation. Apply 1.5 lb. urea or 40 lb. manure. Fertilize young trees monthly using half spring rates. Spray monthly (May 1 – August 1) to control codling moth worms. Time sprays to visual ID of worm holes in fruit. Control aphids if damage exceeds 50% leaves crinkled and aphids present. Using spring rates, fertilize and irrigate mature trees right after harvest. Clean up fallen fruit to reduce codling moth. At leaf fall, remove and destroy or compost leaves to prevent the spread of apple scab.